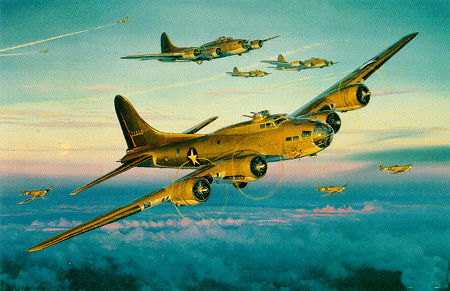 Image Size: 22" x 14-3/4"
This B-17--which led the first 100-airplane daylight raid on occupied France with Tibbets, Ferebee, and Van Kirk on the flight deck, and flew General Eisenhower to Gibraltar to command the invasion of North Africa-- is countersigned by six men who flew and maintained the aircraft during her illustrious career. Accompanying the print is a specially made gold bullion patch based on the Red Gremlin's unique nose art. Countersigned by pilot Paul W. Tibbets, bombardier Thomas W. Ferebee, navigator Theodore J. Van Kirk, flight engineer/top turret gunner Herman Haag, ball turret gunner Zackie T. Gowan, Jr.; and assistant crew chief Charles H. Peach.